We’re thrilled to announce the arrival of the brand-new Mazda CX-8 Diesel to the Aussie shores. That’s right, diesel! Managing Director of Mazda, Vinesh Bhindi, has stated more and more Australian’s are opting for larger SUVs to suit the demands of their busy lifestyles. The brand-new Mazda CX-8 diesel is the perfect fit for those who need the versatility, and the economy that diesel affords. 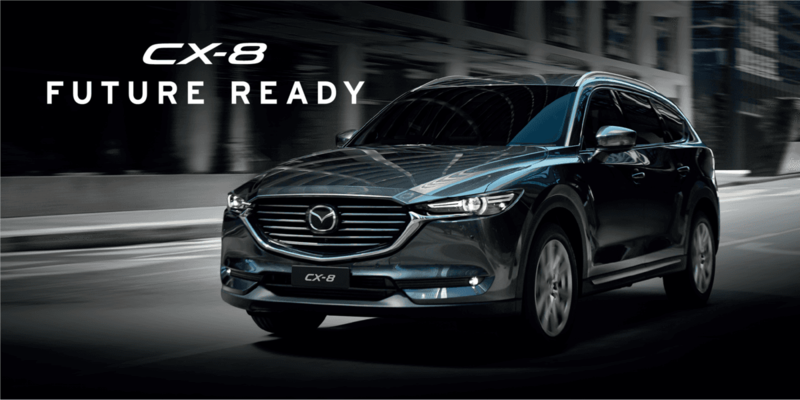 The luxurious CX-8 Diesel is launching in Australia and now Grand Prix Mazda Aspley. To celebrate the occasion, we want you to join us on Saturday, July 7th, as we unveil this much anticipated vehicle to the Northside. The stylish new three-row, seven-seat SUV offers the spacious versatility of a large car, with smaller dimensions that won’t comprise on cabin comfort, drive or power. A stunning, streamlined design with all the refinement and craftsmanship you’d expect from a Mazda SUV. The outstanding SKYACTIV-D diesel engine offers a new level of efficiency with plenty of torque for those who love their Zoom-Zoom. This IS the SUV for growing families. Sitting between Mazda’s CX-5 and CX-9 on the sizing scale, brand-new Mazda CX-8 Diesel is narrower and shorter than its elder sibling. This smaller stature allows for better maneuverability, at the same time offering growing families the flexibility of a comfortable seven-seat option. Most importantly, the brand-new Mazda CX-8 diesel offers Aussie drivers peace of mind. Featuring the latest in advanced safety equipment and loaded with Mazda’s i-ACTIVSENSE technologies, you can rest assured every time you get behind the wheel. We can’t wait to host the CX-8 diesel launch at our luxurious Aspley showroom, and we encourage anyone interested to join us in the unveiling. Go beyond the drive and fall in love with the new Mazda CX-8 diesel - we have. Make sure you’re at this exclusive event! it’s going to be an amazing day at Grand Prix Mazda Aspley.